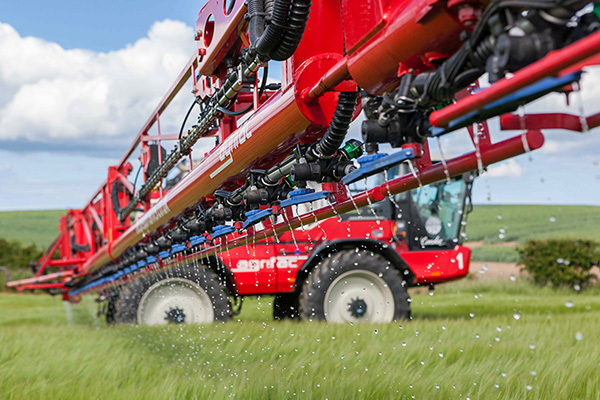 Liquid fertilisers are more convenient than solids as they allow farmers to use much wider booms more easily, saving them time and minimising wheel damage. Liquids can also be applied accurately, right up to the field border, reducing waste and helping compliance with NVZ guidelines, as well as ensuring consistency of application, and eliminating field margin contamination. The accuracy in applying liquid fertilisers comes from the applicator. Dribble Bars from market leader BFS allow fertiliser to be applied with precision, whatever the boom height or width, through four equally-spaced openings, with application rates pre-set to one of eleven different flow rates. These rates can be easily altered in the field with a simple adjustment, and without removing the Dribble Bar. If farmers want variable rate application, they can use the BFS Autostreamer and change the flow rate from the sprayer control box inside their cab. Or, if they prefer the flexibility of using a multiple nozzle holder, the BFS 5 Star nozzle gives a greater range of rates than any other fertiliser jet available. Dribble Bars and Autostreamers ensure that crop contact is reduced, thus minimising the risk of scorch damage; always provided, of course, that, after periods of high wind, farmers allow crops sufficient recovery time before spraying. Applicators are available from BFS Fertiliser Services, www.bfsfertiliserservices.uk, along with the firm's liquid fertilisers which can be specifically tailored to meet individual crop nutrition requirements. The BFS liquid range includes NitroSulph, a bespoke concentrated nitrogen product containing sulphur, which is an easy way to apply much needed SO3.